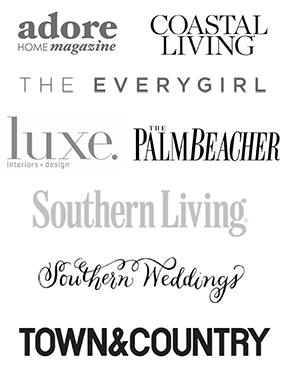 This year as we head into Thanksgiving, we are overflowing with gratitude! 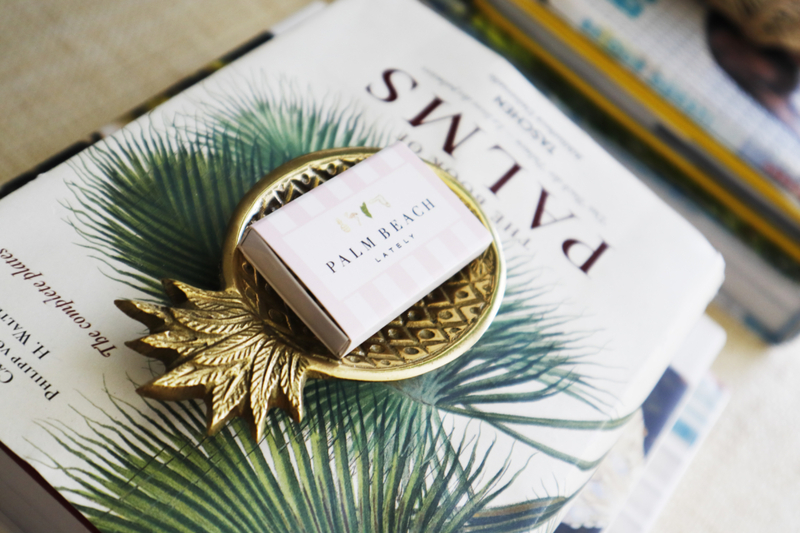 At the top of our list, we are so thankful for the talented team of people who helped us bring our new “Pineapple Pad” vacation rental to life. 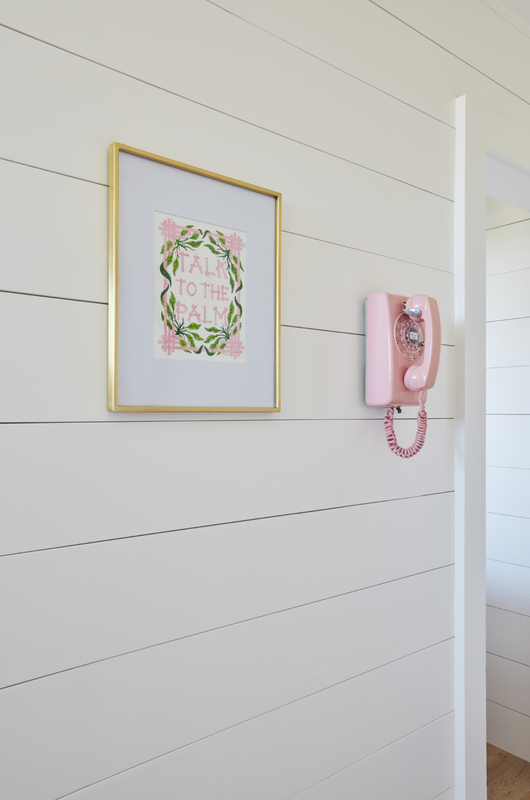 In the last couple of weeks, we moved in the furniture, styled the décor and photographed the condo with the super sweet Brantley Photography. 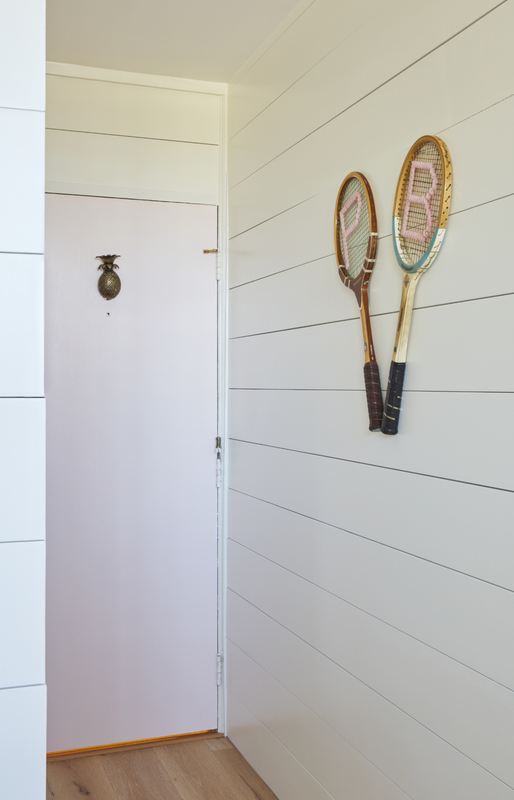 The vacation rental is even more beautiful than we envisioned, and we are so excited to say it is now available to book! 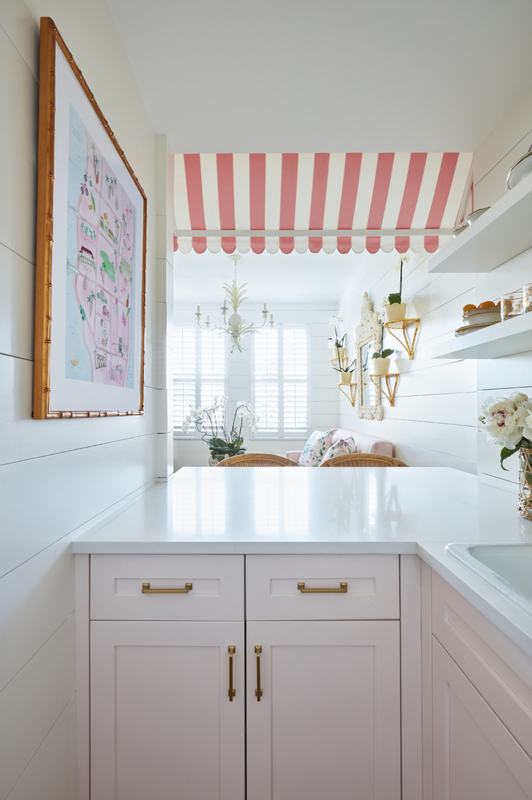 The kitchenette has been transformed to feel like a stylish cabana bar with a custom pink and white striped awning, rattan barstools, pink cabinets, and gold hardware. 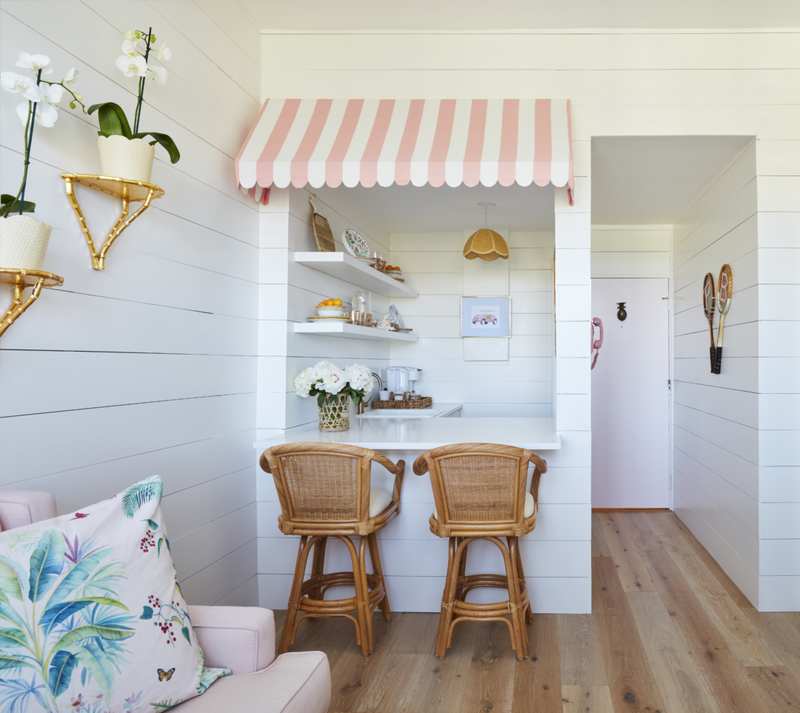 Guests can serve bites and drinks on the bamboo plates, bowls and serving ware, floral plates, wicker drinkware, and a pineapple cutting board from the open shelves. 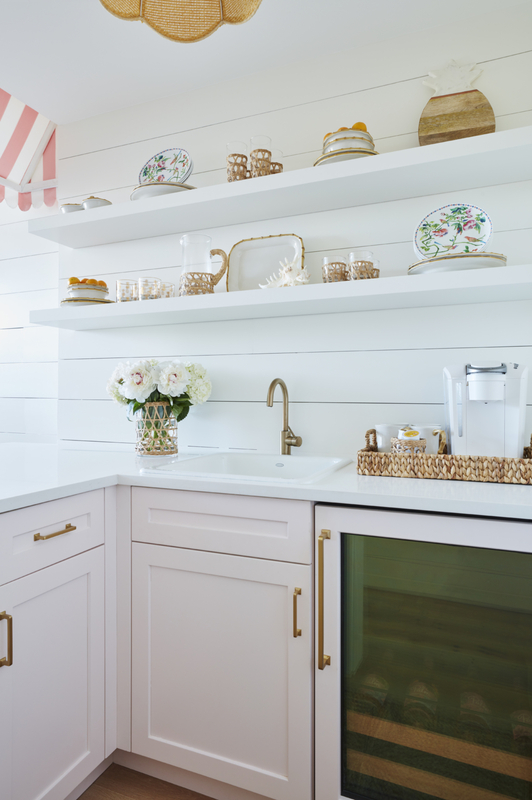 We imagine our guests brewing a fresh cup of coffee with buttery croissants for breakfast and enjoying cheese and chilled wine from the luxurious beverage cooler in the evening! 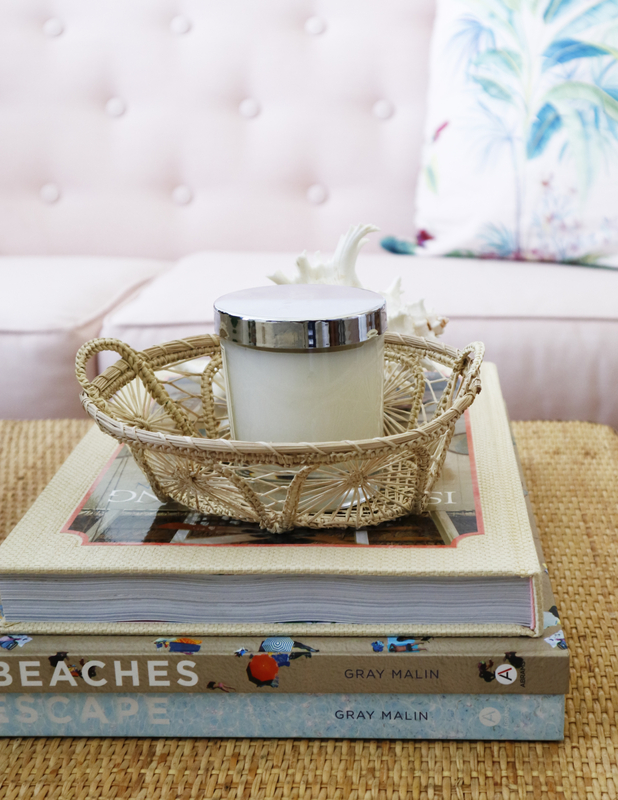 In the living room, we wanted to create a special space where guests can curl up and relax. 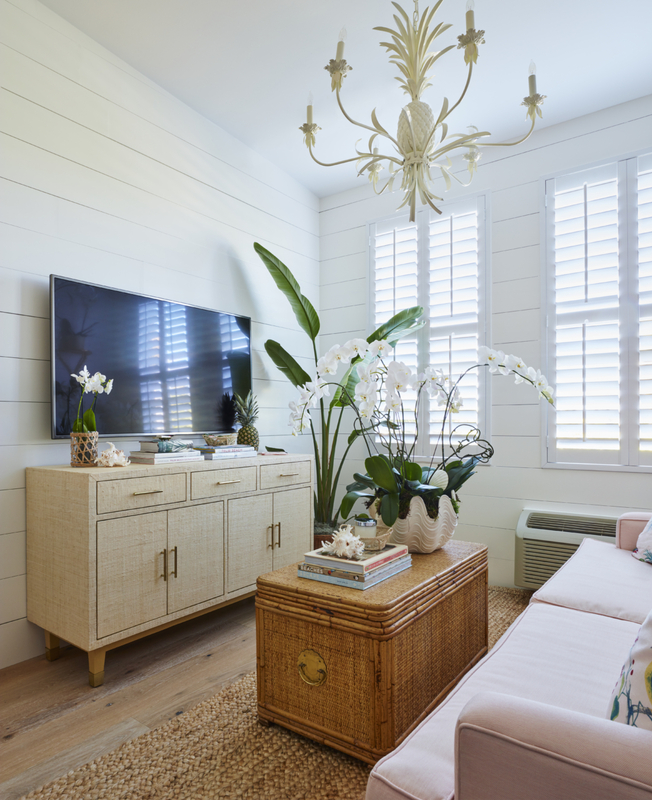 The custom blush couch is the perfect spot for reading a good book, watching a favorite show or movie or relaxing after a day in the sun. 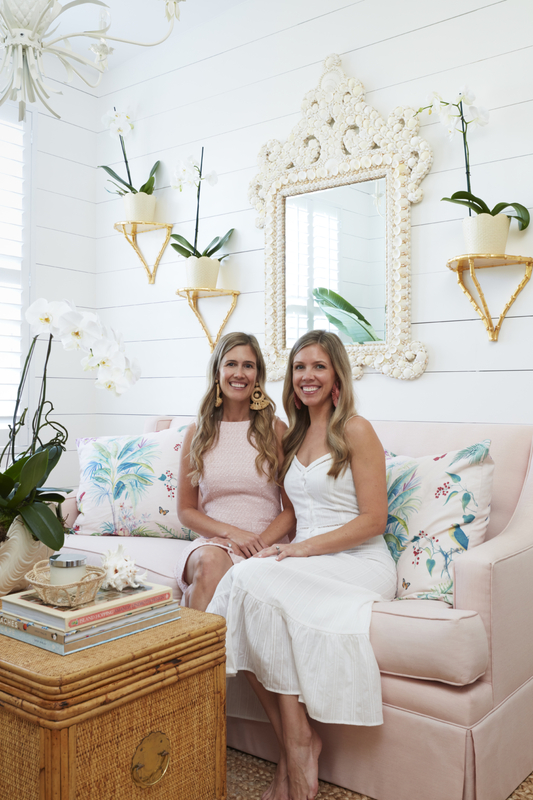 Above the couch, we hung our favorite pineapple chandelier, shell mirror and gold brackets with fresh orchids sitting on top to bring the outdoors inside. 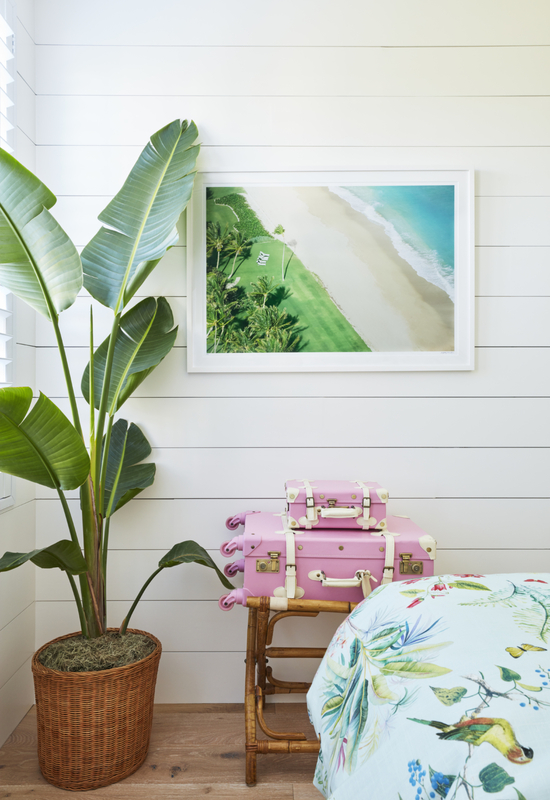 The vintage rattan trunk and grasscloth credenza are also stocked with some of our favorite books, playing cards, and throws for guests to use. 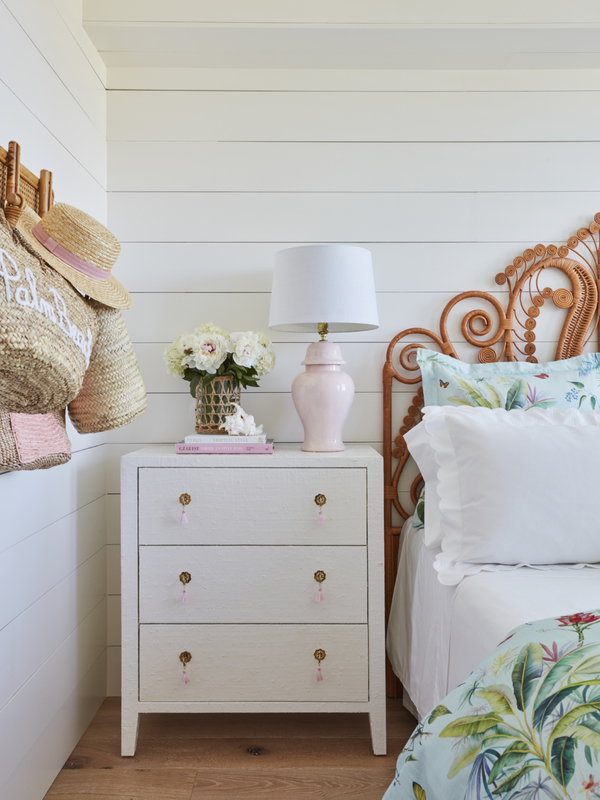 The bedroom feels like a chic beach retreat with clean and simple white shiplap walls, oak floors, a rattan headboard and white lacquered raffia chests with blush tassels. 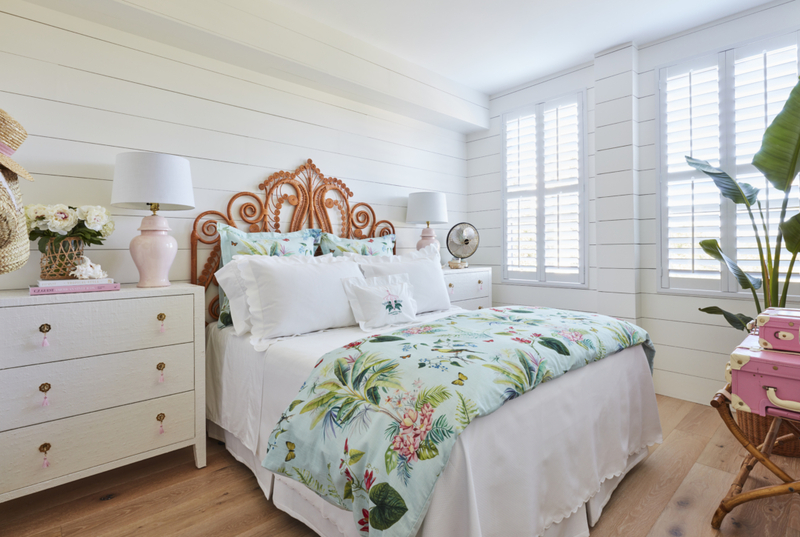 Guests can look at the beautiful photograph of Palm Beach while resting on the comfortable mattress that is fitted in luxurious white scallop linens and palm print linens. 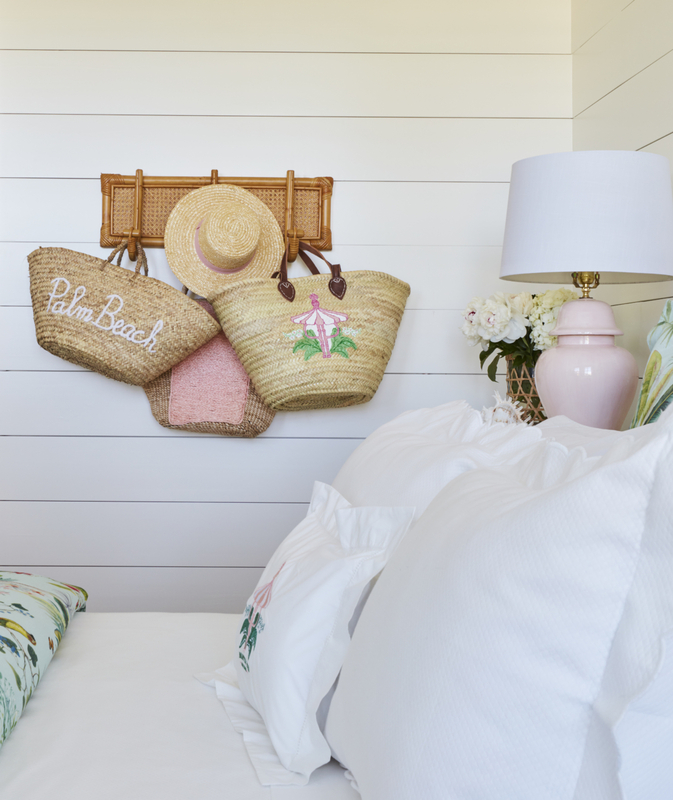 We also hung our favorite straw beach bags on the rattan wall rack and have felt hangers, an iron and ironing board available for use in the custom pink and white striped closet. 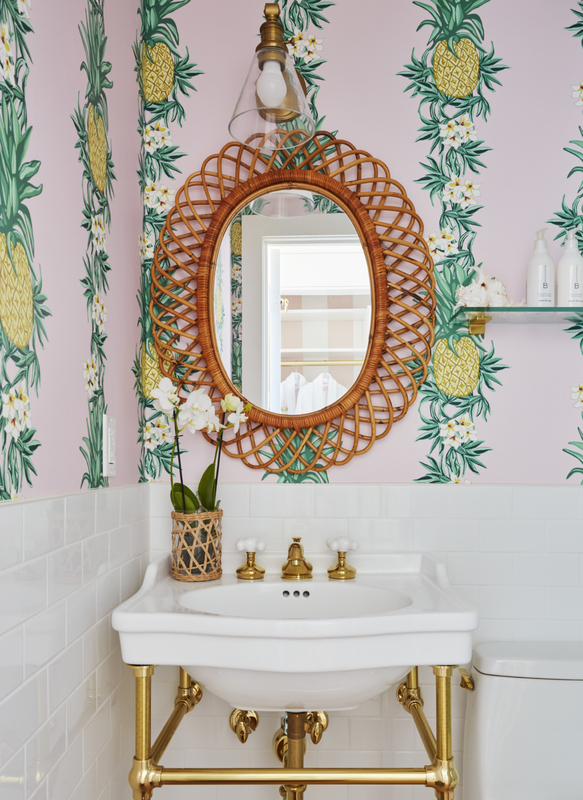 Last but not least, the petite bathroom has lots of personality with pink and green pineapple wallpaper. 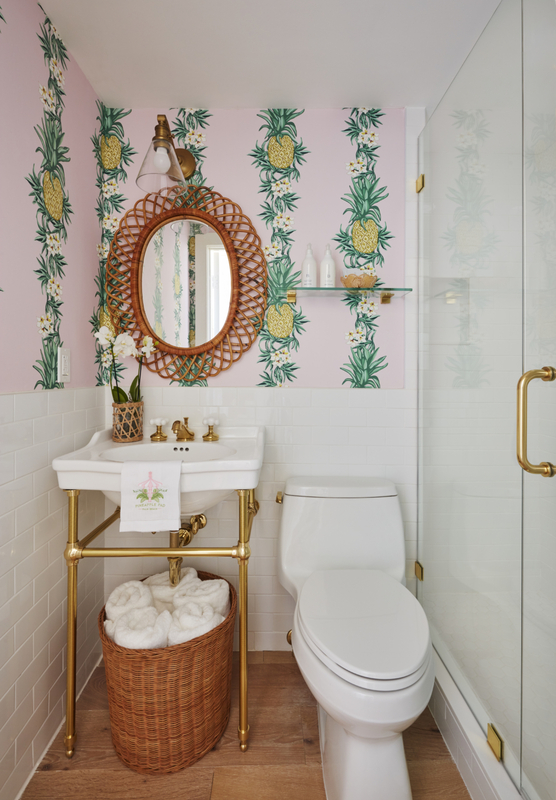 We transformed the space to include a brand-new shower with gold fixtures, a brass washstand sink and a vintage rattan mirror. 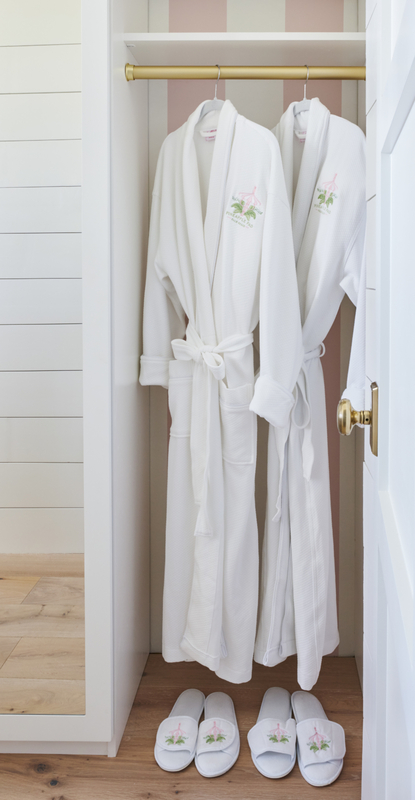 Guests can find plush white washcloths, hand towels, bath towels and bath mats, as well as sunscreen, shower gel, shampoo and conditioner for use. 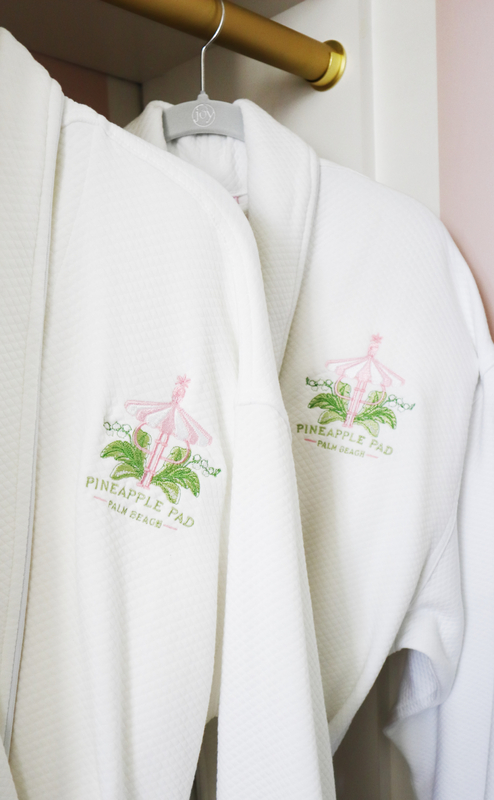 And we complete the luxe getaway experience with a pair of cozy robes and slippers that are personalized with our “Pineapple Pad” logo! 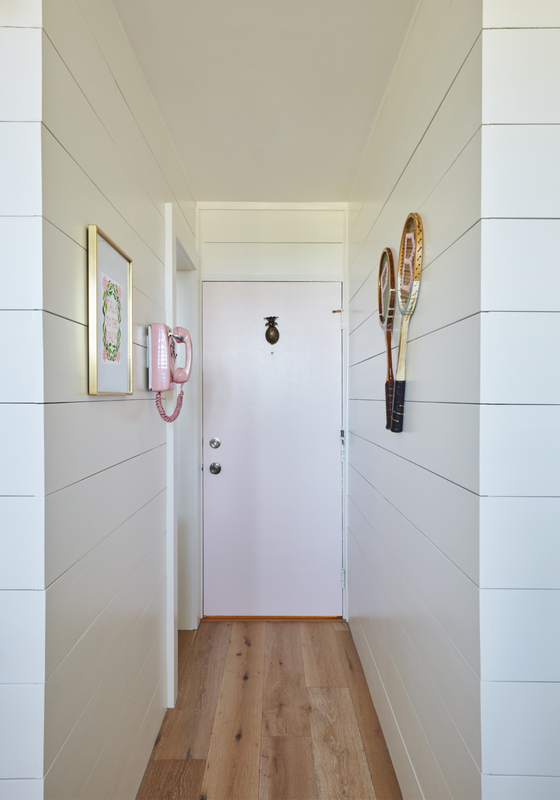 General Contractor: Gregory James, Inc. 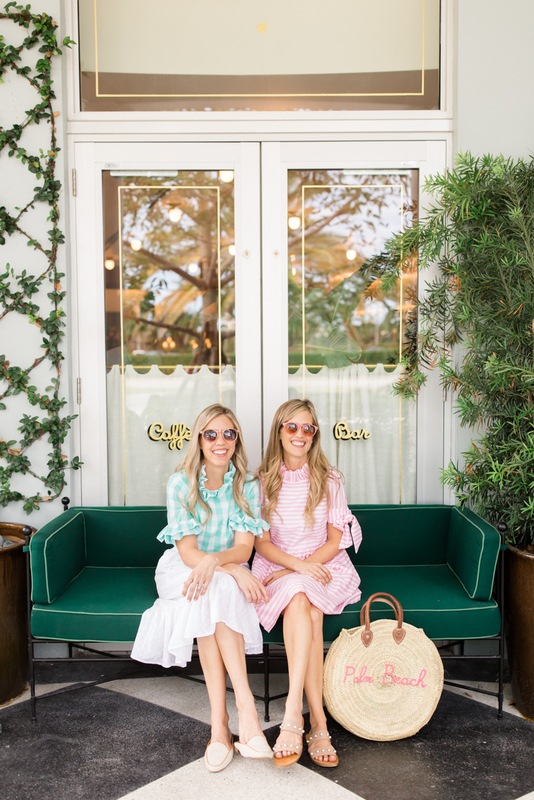 Pink and green pineapple wallpaper: Chelsea Lane & Co.
* For any additional sources not listed, feel free to email us at hello@palmbeachlately.com! 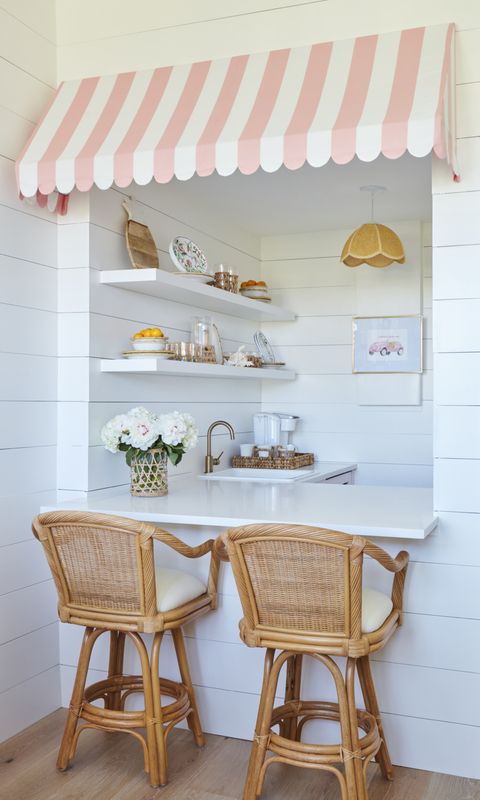 this is the cutest place ever! a huge congratulations to you two! 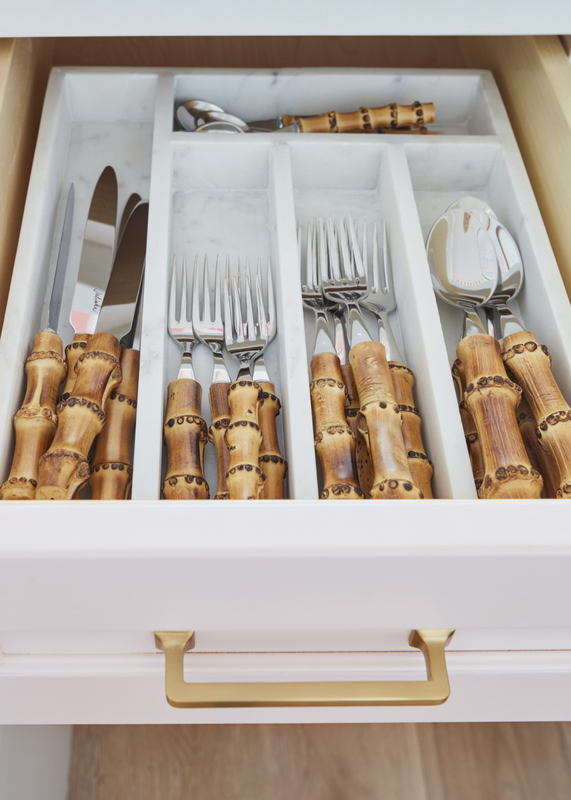 i can tell how much time and effort you’ve put into this space. 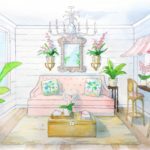 i’m obsessed with it all — it looks amazing! 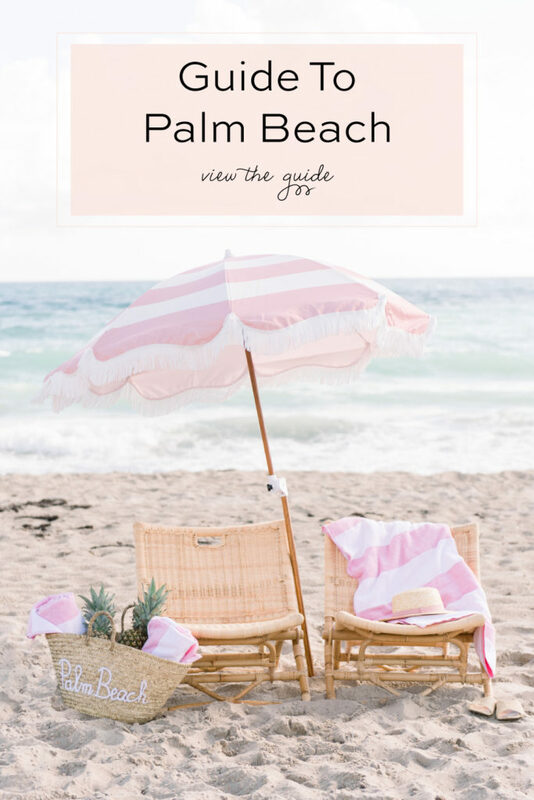 i’m definitely going to be staying here next time i’m in palm beach! Thank you so much Emily! 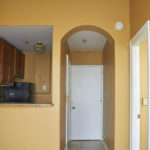 We look forward to having you!